P & P Builders worked closely with Melin Homes to choose Crickhowell Primary School to create a video to promote new ways of reducing energy at home and in the community, as they had already formed some strong links with the school through its various projects in the area. The school is only a 6 minute walk away from site, so staff knew that many of the children would be passing it on their way into school and this would be the perfect opportunity to get them involved and enthused about what was being built in their community. Crickhowell Primary School then handpicked 14 pupils to be involved in the project. These children were picked due to their interests in being greener in the community as they had involvement in covering these subjects. The children were given a practical lesson on site safety and during the visit they were able to put some of their training into practice in the video promoting ‘Site Awareness’ and manoeuvring around the busy site. The following day, staff from P & P Builders and Melin Homes went into the school to deliver an assembly that focused on ‘Being Greener’ and promoting the video. 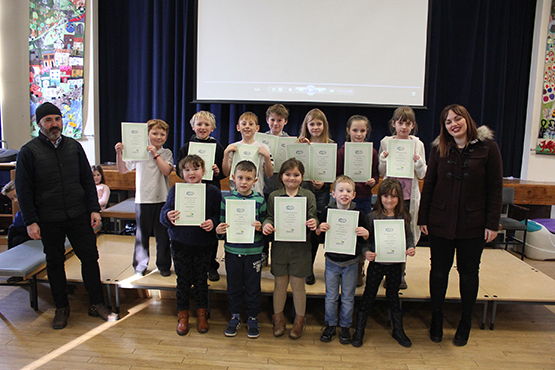 The children were then awarded a certificate of excellence for their hard work and determination to implement greener practices in their curriculum and the community. Site staff and the local community felt encouraged to get involved as a way of sharing pride in their local community. It also would encourage the children to take this new passion and advice home to share with their families and friends. By sharing skills and resources we can all play a part in supporting local communities, businesses and schools.